Robert Naugher is also 100 years old today, born in 1912. Edna and Robert are the children of Moses Service Naugher and his second wife, Marriell Burrows. Their 1/2 brother is Horace Savage Naugher born to Moses Service Naugher and Sallie E. Savage in 1897. Horace married Maxie Ruth Smith and are Tara and Calum's Great-grandparents. Larry Keith Slater II is 22 years old today, born in 1990. Larry is Tara and Calum's 1st cousin, born to Tara and Calum's aunt, Rhonda Lea Naugher. Rhonda is Tara and Calum's father, Brent Steward Naugher's younger sister. HAPPY BIRTHDAY LARRY! Elbridge G. Walker is 194 years old today born in 1818 in Pennsylvania, Pennsylvania. Elbridge is the boys' 4th great-granduncle and the brother of the boys' 4th great-grandmother, Almira Walker who married Samuel Cheney Cotton in 1834. Mary Fish is 275 years old today, born in 1736 in Stonington, Connecticut. She died at age 82 July 2, 1818 in Walingford, Connecticut. Mary is the boys' 7th great-grandfather's wife's brother's wife. Mary married Brigadier General, Gold Selleck Silliman in 1774 in North Stonington, Connecticut. His sister, Amelia Silliman is the wife of her 1st husband and the boy's 7th great-granduncle, Ebenezer Burr. Amelia's second husband is the boys' 7th great-grandfather, Abel Gold, via his first wife Ellen Burr. 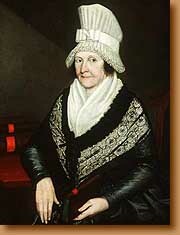 Ellen is the sister of Amelia's 1st husband, Ebenezer Burr. Wow, I think, I got that. Samuel Warner is 329 years old today, born in 1683 in Middletown, Connecticut. Samuel died at age 48 on May 6th 1732 in Middletown. Sam is the husband of the boys' 8th great-grandaunt, Susannah Hall. Susannah's sister is Experience Hall who married Samuel Cotton and begot William Cotton in 1720. Mary Magdelaine Le Fevre is 206 years old today, born in 1806 in Washington, Virginia. Mary died April 13, 1883 in Harrison, IN at age 76. Mary is the boys' 4th great-grandmother. She married James Johnson in 1824 and begot Amanda Johnson in 1833. Amanda married Andrew J. Wooden in 1858 in Owen, IN and begot Joseph R. Wooden in 1860. Andrew Jackson Wooden is 179 years old today, born in 1833. Andrew is the boys' 3rd great-grandfather. He married Amanda Johnson November 24, 1858 in Owen county, Indiana. They begot 6 children, Joseph R. Wooden (sometimes known as James), Jeremiah Wooden, Elba Wooden Minnie Hodges Wooden, Lola Wooden and Harvey Houston Wooden. Chalmers Cole Wooden, Sr. died 26 years ago today in 1986. Chalmers is the boys' 3rd cousin 4 times removed, son of 2nd cousin 5 times removed, John Henry Wooden, the son of 1st cousin 6 times removed, Abraham Wooden, who is the son of 5th great-granduncle, John Wooden, the brother of 5th great-grandfather, Robert Madison Wooden, Jr.
Lucy Ann Kelley died 65 years ago today in 1947 at age 90 in Sand Rock, Alabama. Lucy is the kids' 4th great-grandmother. She married William M. McMurrey in 1873 and begot 11 children. Ida Jan McMurrey was the 3rd born in 1881. Ida married William Mitchell Mayne December 31, 1899 in Alabama and begot 8 children with Donie Mae Mayne being the 3rd born in 1909. Wihelmina Flora died 75 years ago today in 1937 at age 79 in Kansas City, Kansas. Willey is the wife of Steve's 4th great-granduncle, Henry Wilford Conrad, the brother of Mary Ann Conrad who married Daniel G. Everhart and are Steve's 4th great-grandparents.